Electrical engineering graduate student Vince Wu has been selected by Analog Devices (ADI) to receive the Outstanding Student Designer Award. The award, presented annually by ADI since 1997, recognizes excellence in system-level integrated circuit architectures or in analog, mixed-signal, or digital integrated circuit design. Wu was nominated by his advisor, Donhee Ham, Gordon McKay Professor of Electrical Engineering and Applied Physics, for his work on novel circuit design research that holds great potential in neurotechnology and medicine. Wu, who earned a bachelor’s degree in electrical engineering from the University of Washington, is a third-year Ph.D. candidate at the Harvard John A. Paulson School of Engineering and Applied Sciences (SEAS). He designs complementary metal–oxide–semiconductor (CMOS) chips that can be used to study the activity of neurons, collaborating with Hongkun Park, Professor of Chemistry and Chemical Biology and of Physics, and Jeffrey Abbott, a post-doctoral scholar the in Ham and Park labs. CMOS chips are at the heart of everyday electronics; they make possible cell phones and computers, for instance. The circuit in a CMOS chip can be designed to achieve a broad variety of goals, and Wu is developing a chip to record and stimulate signals from neurons. By culturing neurons onto a CMOS chip, Wu and his collaborators study neuronal activity, connections, and group formation. But current methods require a human to read information sent to a computer, then send signals back to the cells during the experiment. Wu solved that problem by developing a chip that includes a feedback circuit. His design not only reads signals after a neuron fires, it can also instantly send a signal back to a different neuron, or group of neurons, creating a closed system that does not require human interaction. Speed is paramount in developing CMOS chips, since the circuit needs to be fast enough to understand what a cell does, analyze the output, and act in a matter of milliseconds, Wu said. It is also challenging to develop a biological package for the metallic chip that can keep the cultured cells alive long enough to conduct experiments. 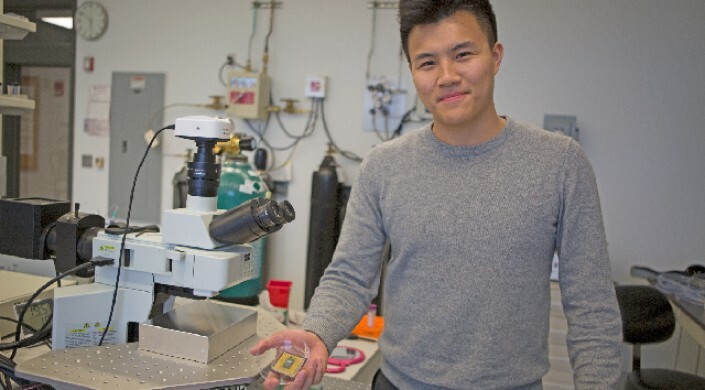 Wu first saw the potential biological applications of engineering during his undergraduate training, where he developed a faster and more efficient diagnostic platform that leverages silicon-photonic technology and microfluidics. The son of two physicians, he found a perfect marriage of his passion for engineering and his desire to help people suffering from diseases. Though Wu isn’t set on his future plans, he wants to use his knowledge to help improve care for patients.